Between 30% and 50% of injuries of immature athletes are due to overuse. This varies from about 15% in soccer to 60% in swimmers. Sports that require repetitive acts are most likely to cause overuse problems. 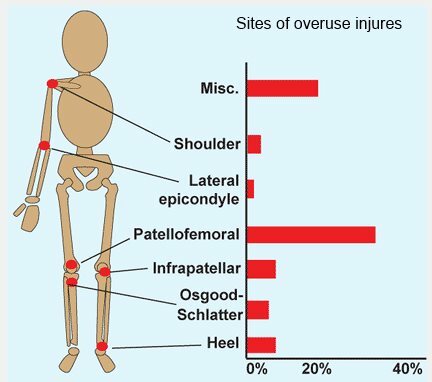 As compared with acute injuries, overuse injuries take longer to heal and result in more time away from competition. Most injuries are the result of excessive demands on an unprepared system. Extremity malalignment, limited flexibility, excessive demands, and improper equipment and playing surfaces increase the risks. Overuse injury seldom occurs in the normal play of children. The protective mechanism of pain limits overuse and promotes recovery. This protective mechanism is often repressed during regimented childhood sports. A large portion of sports medicine in children deals with the care of these overuse conditions. Overuse injuries result from repetitive submaximal loading. The injuries from this microtrauma are usually reversed by rest. Repetitive microtrauma without intervals of rest is cumulative and causes stress injuries. Stress injury to bone creates a progression of inflammation, periosteal swelling, and endosteal and cortical disruption. Stress injuries in children include fractures through the growth plate or bone and disruption of bone to tendon or muscle junctions. They may also affect the vascularity of bone, resulting in bone necrosis, as seen in osteochondritis dissecans. Before an overt fracture occurs, the injuries are referred to as stress reactions. The location of the injury depends upon the stresses created during specific activities of each sport. For example, wrist and back pain from overuse are common among gymnasts, swimmers have shoulder pain, whereas runners’ injuries occur in the lower limbs. Make an accurate diagnosis to be certain that some more serious problem is not the cause of pain. History should include the type of sporting activity associated with the onset, training (including frequency and duration), previous injuries, new techniques or equipment, and whether the patient is in a period of rapid growth. Detail the onset, character, location, and pain relationships with activity and time of day. Beware of night pain, as this can be a sign of a tumor. Pain severity Based on the history, it is often useful to grade pain severity. Grade I pain with excessive activity. Grade II pain with moderate activity. Grade III pain with routine daily activities. Examination Localize the pain and determine the site of maximum tenderness. This will often help to establish the diagnosis. Localized tenderness to the tibial tubercle is classic for Osgood-Schlatter disease, and tenderness over the origin of the plantar fascia are classic findings for the common heel pain in children. Look for evidence of malalignment problems in lower limbs, such as the combination of femoral antetorsion and external tibial torsion or malalignment of the quadriceps mechanism. Assess the interaction of the parent(s) and patient. Overzealous and controlling parents may aggravate the problem. Be concerned if the parent talks more than the child and makes comments that do not fit the appearance of the child. Such comments as “best athlete on the team,” “tough minded,” or “plays with pain” may be used to describe a child who is detached and unathletic appearing. Attempt to assess the patient’s attitude regarding physical education: Is participation a positive or negative experience for the patient? Does the patient exaggerate the disability in an attempt to get a PE excuse, or is the injury being minimized to reduce the risk of being benched, or is the injury overplayed to avoid unwanted participation forced on the patient in the first place? Differentiating stress fractures from neoplasm or infection This is usually not difficult. Stress fractures occur in specific locations and show typical clinical and imaging features. Assess the effect of rest. With rest, the pain and tenderness of stress fractures resolve or improve over a period of days. If the clinical features are atypical and the early differentiation important, image with CT scans to show the fracture line, bone scans to exactly localize the lesion, and laboratory studies of CRP and ESR to aid in differentiating infections. Healing The stage of healing may be assessed by MRI. This study is not appropriate for screening but may be useful in assessing progress in chronic cases. Management of stress injuries is simple—rest. In most situations, rest is relative. The frequency and magnitude of training are reduced, and other less stressful activities are substituted. The challenge is in preventing recurrence. This requires an understanding of the cause. Rest If activity modification is insufficient, cast or splint immobilization may be necessary. Modify factors contributing to stress injuries These are commonly categorized as extrinsic or intrinsic [C]. Identify and modify these factors, provide pain control, and rehabilitate before returning the patient to activity. Return to sports should be carefully supervised and gradual. Prognosis Most stress injuries and fractures heal with rest and cause no long-term disability. Stress injuries are rarely serious. Displaced stress fractures are rare but may occur if the activity continues, even when pain occurs. The most serious fractures include the femoral neck and tibia. Spondylolithesis is common in gymnasts. Displacement progresses to the severity that fusion becomes necessary. Growth plate injuries, such as the distal radius in gymnasts and proximal tibia in runners, may lead to growth arrest and bone shortening. Osteochondritis dissecans commonly causes permanent joint damage with premature degenerative arthritis and long-term disability. Bony overgrowth, such as a permanent prominence of the tibial tubercle or radial head, may cause mild long-term disability.